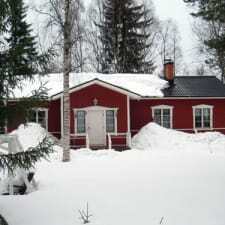 Holiday House Lapland offers cosy and comfortable accommodation for independent travellers or groups in Rovaniemi. Excellent choice also for families with little or bigger children. Good possibility to familiarise and feel Finnish lifestyle in this traditional Finnish style chalet. Full equipped kitchen with electricity hobs, large living room with a fireplace, 2 bedrooms and a sleeping corner, household room, bathroom. Suitable for max. 9 persons. Also possible to ask for an extra bedroom (Studio-room with own bathroom) as extra service. This beautiful chalet is located next to the Ounasvaara Winter Sports Center... Go skiing from the door of the house, only 150 m to the Skiing Center office and ski lifts. Golf area is also within 700 m.